B.S. in Chemistry, Humboldt State University, 1984; Ph.D. Chemistry, Cornell University, 1989; NIH Postdoctoral Fellow, Harvard University, 1989-1992. 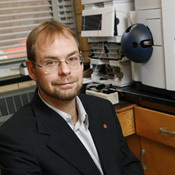 1992-1998, Assistant Professor, University of Minnesota; 1998-2004, Associate Professor, University of Minnesota; 2004-2006, Professor, University of Minnesota; 2007-present, Professor, Ohio State University. Merck UK Lectureship, 2007; Eli Lilly UK Lectureship, 2004; Novartis Chemistry Lectureship, 2003; The Royal Australian Chemical Institute Lectureship, 2000; Japan Society for the Promotion of Science Fellowship, 2000; Bristol-Myers Squibb Research Award in Synthetic Organic Chemistry, 1999; Zeneca Pharmaceuticals Excellence in Chemistry Award, 1997; McKnight-Land Grant Assistant Professorship, University of Minnesota, 1995-1997; 3M Alumni Assistant Professorship, University of Minnesota, 1992; National Institutes of Health (NCI) Postdoctoral Fellowship, Harvard University, 1989-1992; National Institutes of Health Predoctoral Trainee, Cornell University, 1987-1989; New York State Sea Grant Scholar, Cornell University, 1986-1987; DuPont Outstanding Teaching Award, Cornell University, 1986; Fellow of the American Association for the Advancement of Science, 2010. The general theme of our research is the synthesis of complex, biologically active organic molecules based upon natural product templates. Natural product targets are chosen that provide maximal synergy among the implementation of synthetic strategies, the development of new methods, and the potential for biological applications. Although target oriented complex molecule synthesis is emphasized, enabling synthetic methods derive from particular challenges encountered in the pursuit of novel tactics and strategies. Current projects span various structural classes and biological activities of the synthetic targets. These include protein serine / threonine phosphatase inhibitors based upon members of the okadaic acid class, the potent anticancer natural product phorboxazole A, the marine biotoxin azaspiracid, and a variety of smaller molecules. On chemical biology fronts, we are engaged in defining the structural bases for selective protein serine-threonine inhibition; elucidaitng the mode and mechanism of action of the phorboxazole, thyrsiferyl, and apratoxin natural products; and developing broad antibody-based assays for the detection of marine toxins. H. Roy, S. B. Zou, B. Wolfe, M. Gilreath, C. J. Forsyth, W. W. Navarre, and M. Ibba “The tRNA Synthetase Paralog PoxA Modifies Elongation Factor-P with (R)-ß-Lysine” Nature Chemical Biology 2011, 7, 667-669. Y. Pang, C. Fang, M. J. Twiner, C. O. Miles, and C. J. Forsyth “Total Synthesis of Dinophysistoxin-2 and 2-epi-Dinophysistoxin-2 and Their PPase Inhibition” Angew. Chem. Int. Ed. 2011, 50, 7631-7635. B. Wang, T. M. Hansen, T. Wang, D. Wu, L. Weyer, L. Ying, M. M. Engler, M. Sanville, C. Leitheiser, M. Christmann, Y. Lu, J. Chen, N. Zunker, R. D. Cink, F. Ahmed, C.-S. Lee, and C. J. Forsyth “Total Synthesis of Phorboxazole A via de Novo Oxazole Formation: Strategy and Component Assembly” J. Am. Chem. Soc. 2011, 133, 1484–1505. B. Wang, T. M. Hansen, L. Weyer, D. Wu, T. Wang, M. Christmann, Y. Lu, L. Ying, M. M. Engler, R. D. Cink, C.-S. Lee, F. Ahmed, and C. J. Forsyth “Total Synthesis of Phorboxazole A via de Novo Oxazole Formation: Convergent Total Synthesis” J. Am. Chem. Soc. 2011, 133, 1506–1516. B. Wang, P.-H. Huang, C.-S. Chen, and C. J. Forsyth “Total Syntheses of the Histone Deacetylase Inhibitors Largazole and 2-epi-Largazole: Application of N-Heterocyclic Carbene Mediated Acylations in Complex Molecule Synthesis” J. Org. Chem. 2011, 76, 1140–1150.